I submitted to the App Store on Monday, and just got notice that its been accepted. Please let me know what you think and what you would like to see in the next version. - add more info per movie, all genres, ratings etc. - save queue etc. data in the iPhone so it starts up quickly and synchronize using a background thread. Allow us to search by Genre! 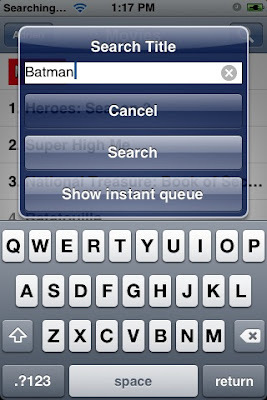 Netflix search engine doesn't really handle searches by genre either. I'm thinking of displaying all the genres rather than just the primary one, and allowing some sorting by genre in the queue and other lists.